IPCC Special Report, Carbon Offsetting, 2019 crazy winter weather, and why its easier climbing at 6000m in Nepal than in Alaska! +1.5°C or +2°C. What difference does it make? On the 1st Oct 2018 the International Panel on Climate Change (IPCC) released a special report comparing a 1.5°C and a 2°C increase in the global temperature above the pre-industrial average. The IPCC defines the pre-industrial average as the average temperature from 1850-1900. 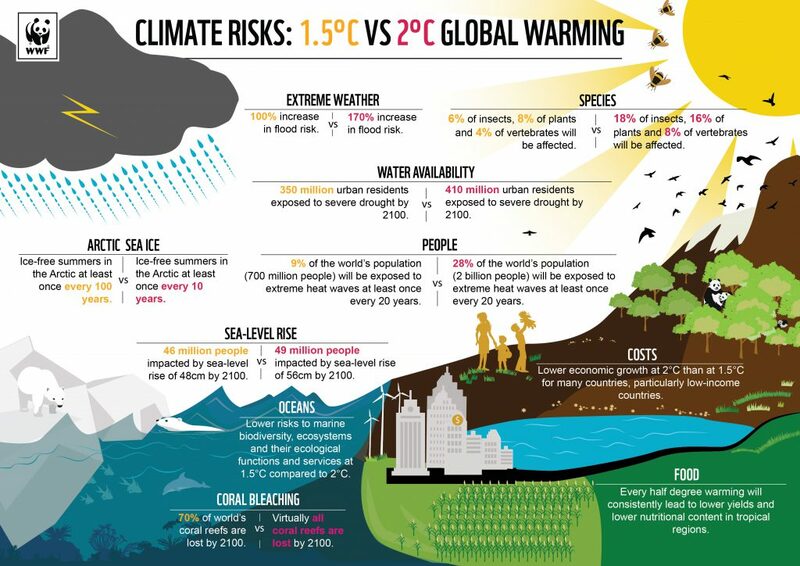 While a warming of 2°C was considered a reasonable target only a few years ago, this new report highlights the clear advantages, particularly to island nations, coral reefs and glaciers, of limiting warming to 1.5°C rather than 2°C. This is a huge challenge for the global political system, each nation, and all of us individually, so it seems useful to try and understand why 1.5°C is so much better. The above graph shows the key differences on the hottest days and the coldest nights. These extremes are interesting because they are what humans (and every other plant and animal species) have difficulty adapting to. An increase from 20°C to 21.5°C or 22°C on a warm summer’s day doesn’t seem very difficult for anyone. However if Toulouse in France starts having 10 days over 40°C rather than only 1 day each year then this is a very different scenario. Infrastructure has difficulty adapting and elderly people and infants in particular become much more vulnerable. It is expensive (and inefficient) to install air-conditioning just for those days, and then expensive and difficult to produce the energy to power it. Instead of hydro-power stations in the Pyrenees and the Alps mainly supplying peak demand in winter perhaps the spring snowmelt will end up supplying peak summer demand with no water left for winter. Then what? Construction of more base load power infrastructure? Again, it is expensive and not very efficient. But without it people die from heat exhaustion. Not an acceptable solution for anyone. 20 years ago in Brisbane, Australia, only the very rich had air conditioning. In 1992 when I was doing my first year at university it was unheard of. Most people just survived the few really hot and humid days in traditional ways – turning on the ceiling fan, going to the pool, heading for the beach, simply sweltering and putting up with it, or going to lie on the bathroom floor! Now only the poor don’t have air conditioning, most people citing the impossibility of sleeping through nights where the temperature doesn’t fall under 25°C. And on those nights the pull on the power grid is huge. 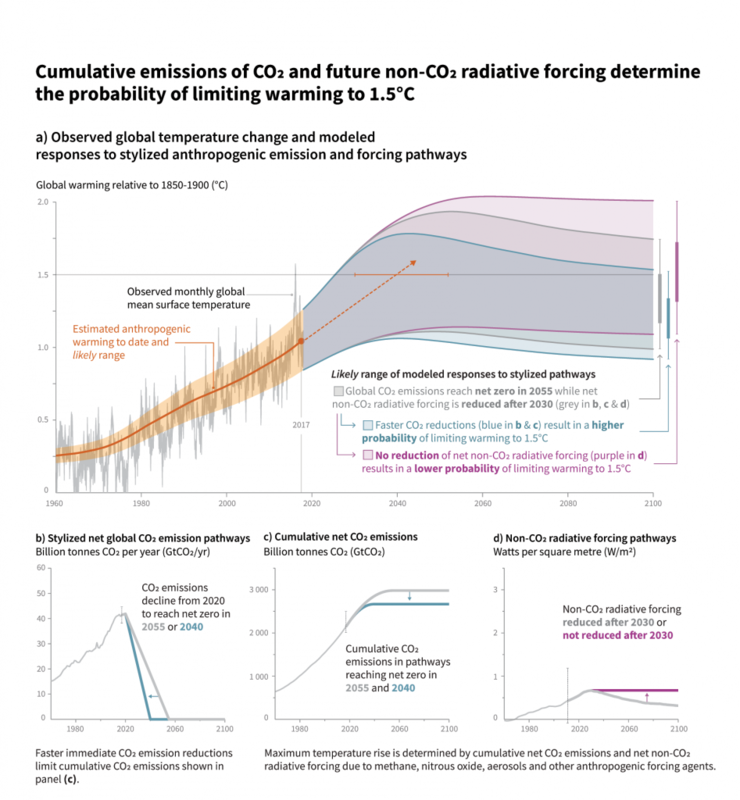 The people at Carbon Brief have put together a summary of all the peer-reviewed scientific data on likely outcomes in a world that is 1.5°C, 2°C and 2°C+ warmer than pre-industrial levels. We are already 0.9°C warmer so we have only 0.6°C to go. This is a big ask, so let’s have a closer look at why scientists conclude +1.5°C is so much better than +2°C. From Carbon Brief’s list I’ve picked out a few points that caught my eye. 1. Arctic sea ice cover. The differences here are astounding. At +1.5°C the “probability of an ice free Arctic summer before the temperature limit is reached” is 10% and at +2°C it is 80%. The “probability of an ice free Arctic summer in any one year” is 3% at +1.5°C and 16% at +2°C. At +3°C there is 63% chance of an ice free summer for any given year – meaning it is more likely to be ice free than not. 2. Heatwaves. The percentage of the “population facing at least one extreme heat wave every 5 years” goes from 14% at +1.5°C to 37% at +2°C. 3. Extreme Rainfall Events. +17% at +1.5°C and +36% at +2°C. This means more flash flooding events, more quick heavy rain that erodes and damages the soil. 4. Drought. At +1.5°C the average length of any drought event is 2 months. At +2°C it is 4 months. Anyone who has ever needed to feed stock knows this is a huge difference. That’s for the planetary outcomes. Now what about Europe? What are the big differences between +1.5°C and +2°C? 2. Rainfall extremes. Over northern Europe at +1.5°C extreme rainfall events increase by 21% and at +2°C they increase by 45%. 3. Wildfires. As we have already seen forest fires are on the rise in Europe. At +1.5°C the area of land burned by wildfires during an average Mediterranean summer increases by 41%. At +2°C it increases by 62%. 4. Economic cost of flood damage. When looking at the economy the one thing that really stands out is the monetary costs from river flooding. The Czech Republic, Germany, UK, Hungary and Poland are predicted to have increases in flood damage from 600% (+1.5°C) to 3000% (+2°C). Our valley had a huge flash flood in 2013 and we are still not finished with repair work in 2018. 33 million € have been spent by the French state on the three rivers in this tiny valley. That was my effort, but have a look at the WWF info-graphic where they have highlighted what they think are the key points. What time-frame are we talking about? 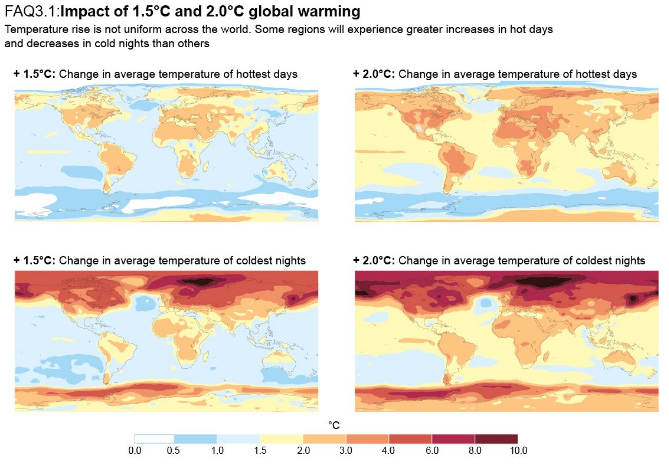 At the current warming rates we hit +1.5°C around 2040, and +2°C around 2065. If we act now, what could it look like? The RealClimate blog has a discussion about this graph. The orange line is the current warming path. The grey area shows the warming path if net CO2 emissions are reduced to zero by 2055 (meaning all CO2 emissions are offset) and non CO2 forcings are reduced to zero by 2030 (methane, nitrous oxides, CFCs, and other minor, long-lived, halogenated gases). Is this in any way possible? Technically, YES! Politically? We are not looking great. How could we help make 1.5°C happen? What is interesting is that when we start talking about it, and focusing on it, change in behaviour often seems to happen, particularly when there is a price signal. Electricity prices became a hot-button political issue in Australia in 2010. Shortly afterwards electricity consumption went into decline. Researcher Hugh Saddler concluded that consumers had not being paying much attention to their electricity bills (which had been rising but without anyone noticing), and that when it became a huge national conversation people started looking more closely. Prices have continued to rise, but consumers have offset the price rises by reducing their consumption, keeping their budgets stable. 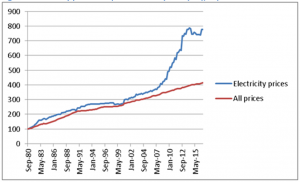 The graph on the left shows electricity prices in Australia vs the CPI (consumer price index). 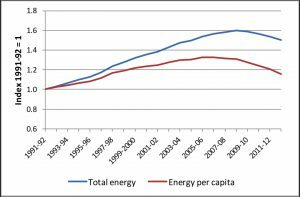 On the right is energy consumption in Australia. The yellow vest protests in France were sparked by the announcement of fuel price rises. 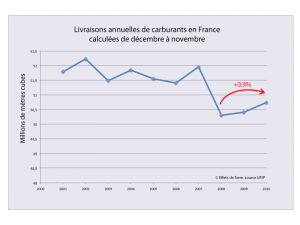 The only time that fuel consumption reduced in France was in August 2008 after the global financial crisis induced a rapid jump in prices. People were talking about it and reducing the number of journeys they made. Prices have been slowly rising for years since then, and slowing absorbing a larger part of people’s budgets. But like the frog in the slowly warming saucepan, we don’t tend to take any notice, or action, when prices rise slowly. It will be interesting to see whether the current protests and spotlight on rising fuel prices induces a change in fuel consumption in France. The financial press is now unequivocal about the dramatic negative implications of global warming and the urgency with which it must be addressed. Martin Wolf in The Financial Times comes down firmly in favour of dramatically shifting investment to minimise warming. “We are the shapers of the planet now. This ought to transform how we think….. The scale of the uncertainty is an argument for action, not inaction. Nobody really knows what risks humanity will ultimately find it has run by continuing on its present course. But we do know that our descendants are quite likely to end up on a different planet, with no way back to our own.” The further we go without addressing it, the higher the costs. And the greater the uncertainty becomes. Not good for business and the economy. A useful way to begin dealing with the political difficulty is for all of us as voters, consumers and citizens to have some idea of what it means in our own lives. What are our own personal greenhouse gas emissions? The WWF has a quick calculator. And Carbon Footprint has a much more detailed one. I for one am terrible at knowing how much electricity I use, how much fuel etc. My new year’s resolution is to start counting all of this rather than simply doing things I presume will help. And in our part of the Pyrenees? What are we up to at Pyrenean Odysseys, Hotel Les Templiers and in our personal lives? Have a look at our “Carbon Offsetting” page on the PO website for a full inventory of our efforts but the basics are: we don’t buy any more meat (still eat it when served, but don’t buy any for cooking at home), don’t serve meat at hotel breakfast or in bar (no ham basically! Eggs and cheese still served), we offset carbon from travel for us and our clients, are continually improving insulation in the hotel, composting all household and hotel organic waste (this has hugely reduced our waste), all fruit and vegetables come from southern and western France or northern Spain, we encourage car sharing and public transport for personal use and for our clients. However, I am sure all this is not enough. We need to continue adjusting our business and our lifestyle to reduce our emissions, and offset those we don’t. The commemorations for the 100 years since the Armistice of 1918 remind us that when collective sacrifice is needed, as a group of nations we are very capable of rising to the challenge. When collective sacrifices are required we are generally happy to do join in, and even end up feeling compelled to participate – when everyone else does. A tipping point is reached when it isn’t possible to continue on the same path, comfortable though that path may be. Australians have long experience with water restrictions and the decade long drought (that broke in 2011 with huge floods) showed that continuous efforts to reduce water consumption were effective and possible. Even when the drought broke water consumption did not rise very much – the new habits had taken hold. We can do it. We just need to start. All the winter forecasts suggested there would be plenty of blocking events this winter due to a weaker jet stream (which is due to a weaker equator-pole temperature gradient, which is due to a warmer Arctic, which is due to global warming generally). And this prediction has come true in an extraordinary way in the USA. So ironically warmer than average winters are perhaps less likely as the Arctic warms. As with every winter these things play out in different ways – the weather is the weather after all. See the following links for more information. Climbing at 5000m in Nepal easier than in Alaska. During an autumn discussion with Richard (high mountain guide) something came up about climbing mountains and different latitudes and why at the same altitude it was easier to climb a mountain in Nepal than a mountain at a higher latitude (Alaska or Patagonia for example). Neither of us knew the science behind it, and a bit of investigation has revealed the why of it all. As we all know, altitude and pressure are not the same thing, even though they are of course related. If you use a pressure based altimeter you need to calibrate it every day with a map to make sure it is accurate on that day. Temperature and weather systems impact pressure and we are all used to looking at weather maps and seeing that sea level pressure changes particularly at altitude, mainly due to the temperature simply being colder as we approach the poles. Colder air is denser, which means the air column closer to the poles is compacted, compared to the air column closer to the equator (which is warmer, so the whole column expands). The troposphere – the first layer of the atmosphere where all the weather happens – is roughly 15 kilometres high at the equator and only 9 kilometres high at the poles (average annual height). So the impact of temperature is large, significantly compacting the atmosphere, although the Earth’s gravitational pull and centrifugal force also play a part and add to the tendency for air pressure to be higher at the poles and lower near the equator. Which means that at 5000m altitude in Alaska there is plenty of air pressure at the surface, but not much at 5000m as there is not much of the troposphere left above (essentially not much air weighing down on you, which is what air pressure is – the weight of the column of molecules above you). Which means it is harder to climb Denali (6190m) in Alaska than Boktah Peak (6114m) in Nepal, all technical difficulties aside. Mandy is leading a trek in Nepal this May where the high point is the Larkya La (5133m) – join her and you can test this out!